Melting Chocolate Very Very Accurately: And then watching it go solid again. The name of this problem was "Chocolate Hysteresis" in that when chocolate melts at a certain temperature, it often doesn't solidify until it cools to a temperature noticeably lower than the melting point. That is a hysteresis in the melting temperature. 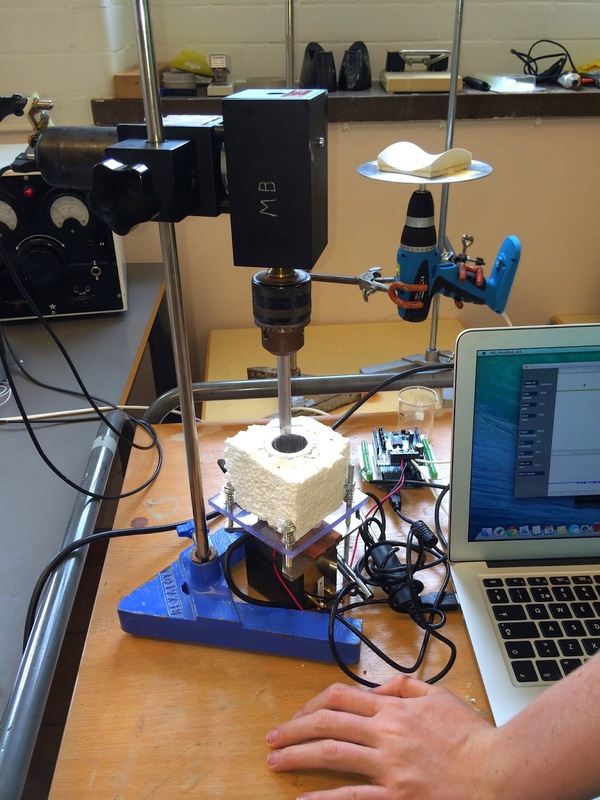 This problem proved to be kind of funky: The most difficult parts about it were measuring the temperature of the chocolate while it was being melted, and attempting to tell whether it was "solid" or "liquid"
The first attempt we built was a simple peltier heated and cooled calorimeter. The temperature was controlled using an Arduino and a motor shield took care of four quadrant driving the peltier. 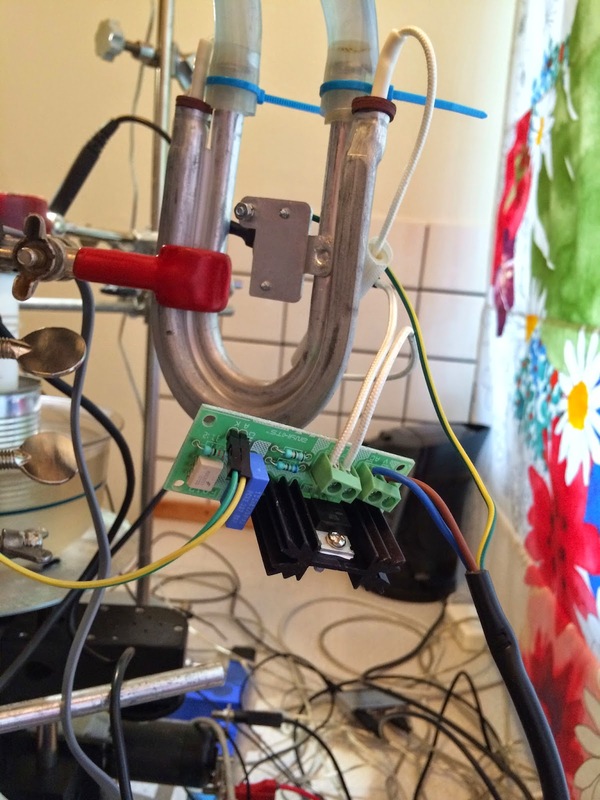 The melting pot was machined from aluminium and the other side of the peltier was stuck to an ex CPU heatsink. Melting pot with stirrer and insulation. Rotating saddle rig in the background. 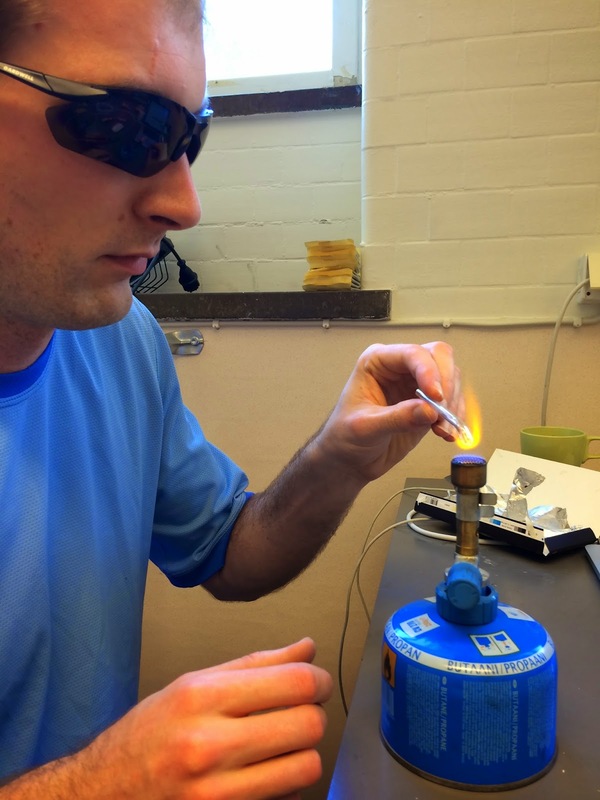 We measured the temperature of the chocolate itself by stirring it with a temperature probe. 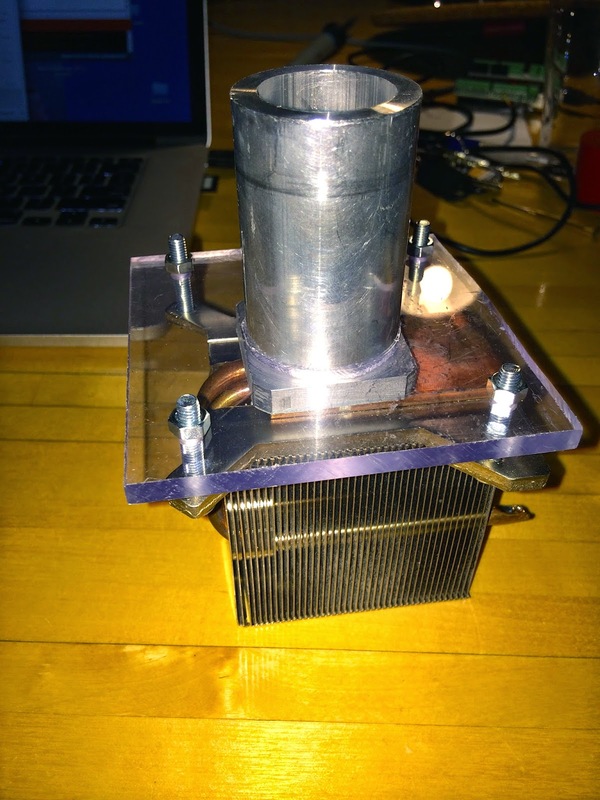 The temperature itself was measured with a DS18B20 temperature sensor embedded into the base of the aluminium calorimeter. 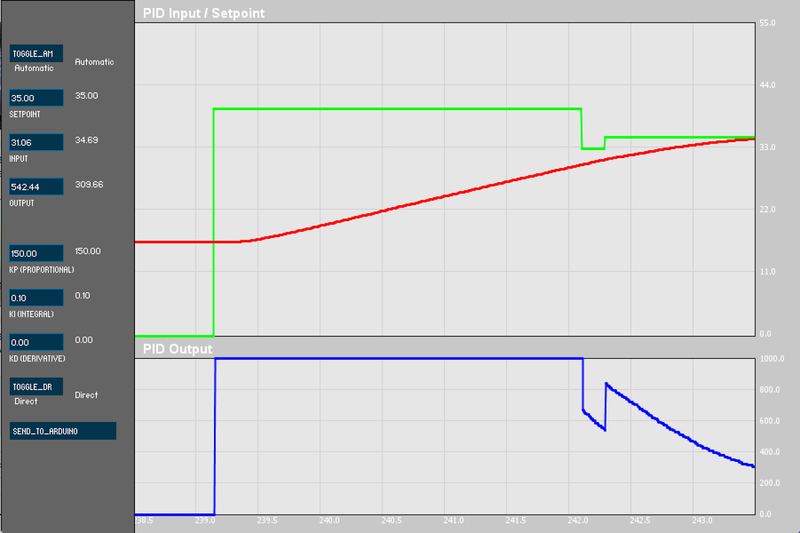 Temperature control was done by a PID sketch running on the Arduino with a gui written in processing. Processing GUI for the PID controller. This setup didn't work all that well, it was a bit slow to melt and difficult to ascertain whether the chocolate had melted or not. Around this time I had done some background reading on rotary viscometry as a possible means of determining whether the chocolate was liquid, solid, or somewhere in between. Rotary viscometry works by measuring the shear force in a liquid by rotating a cylindrical or spherical object in it. 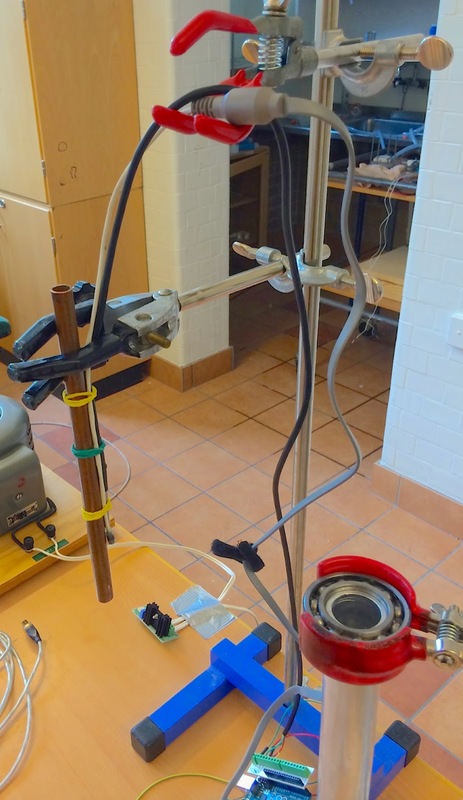 We then set about designing a new rig that would incorporate some kind of rotary viscometer and also allow the chocolate to be heated more quickly. 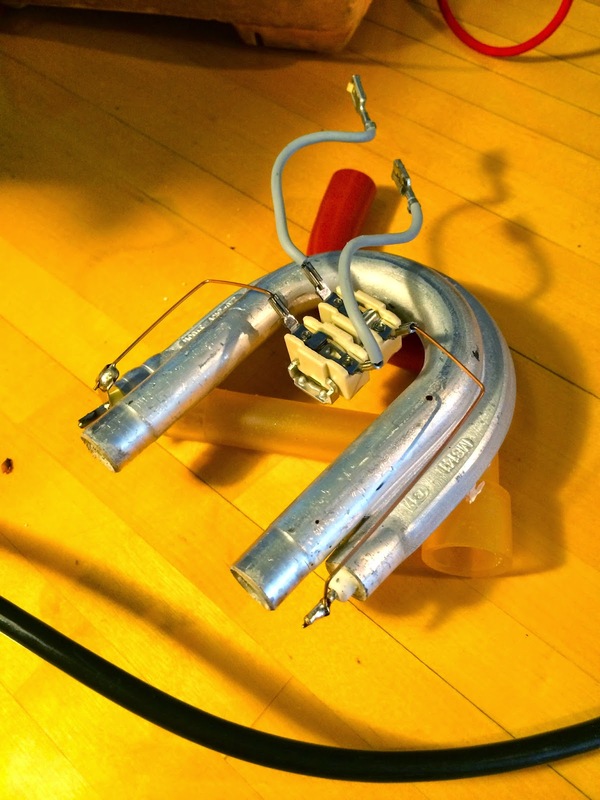 The idea was an aluminium tube mounted on a large ball bearing, this allowed the tube to move with minimal friction. The vessel containing the chocolate was mounted to a turntable allowing it to rotate. Ball bearing and water tubes. This rig was heated slightly differently: The aluminium tube or "probe" was filled with temperature controlled water... This proved a little easier said than done as nothing could touch the inside of the probe and there had to be temperature sensors inside it. We heated the water using an element salvaged from a dead drip coffee machine, thanks to Bill Hammack for Inspiration. Does this element still work? Element liberated from a dead coffee machine. 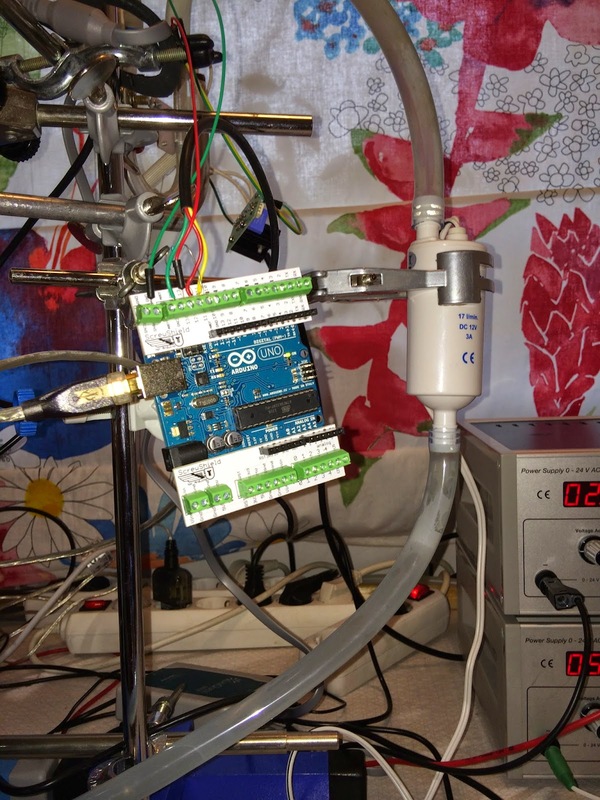 The element was controlled by a solid state relay driven by the same Arduino with slightly different PID code. 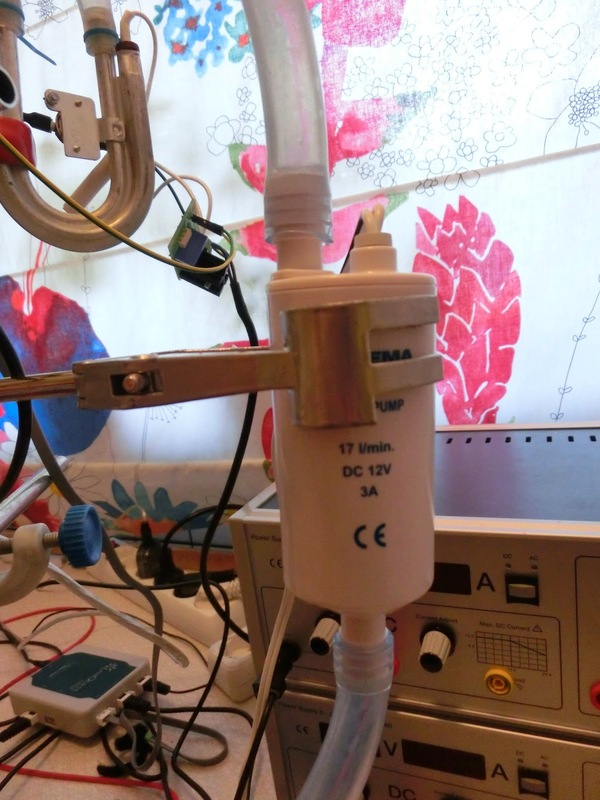 Suction tube with temperature sensors. Pump held in a clamp stand. The water was circulated around the system by a small pump intended for supplying drinking water on boats. We never ran it on more than about 6v... Anything more and it was too powerful. At the top of the probe where there had to be two hoses and two temperature sensors that did not touch anything. Space was getting a little tight. 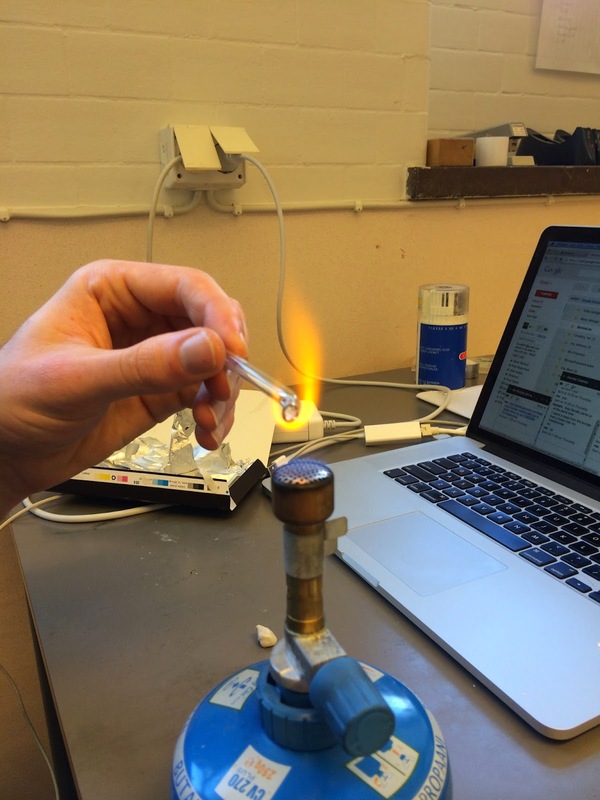 Lacking any other suitable materials to hand, I dusted off my glass blowing skills and made a custom angled glass nozzle to return the heated water to the probe. Around about this time everything was cobbled together with a huge number of lab clamp stands and duct tape. Force Sensor connected to the shear probe. This whole design centred around having the chocolate container rotating, for both stirring the chocolate as it melted and to allow some kind of rotary viscometry. I found in the collection, a very nice gearhead motor with a drill chuck. This was pressed into service to rotate the chocolate container and all its insulation. In order to have some idea of what the viscosity of the chocolate is, the angular velocity of the chocolate container was also measured. This was done with a Vernier Rotary Motion Sensor belt driven from a pulley behind the drill chuck on the motor. 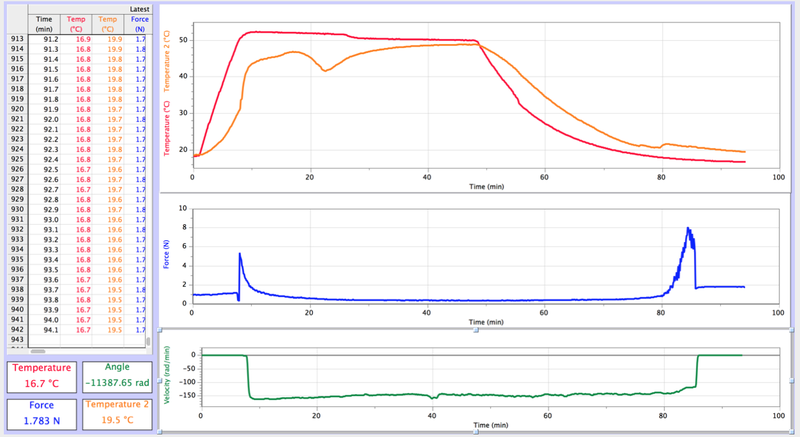 All of the sensors were connected to a Vernier LabQuest Mini to allow data collection in Logger Pro. The data gathering brain of the operation. After all that work this creation still didn't work very well... As soon as the chocolate stated to melt it was pushed away from the probe and re solidified. The failure of V2 brought about the design of V3 pretty quickly. The main change was to make the waterbath on the outside of the chocolate container. Easier said than done as everything is spinning! The video below should make things a little clearer. We made a melting container and waterbath out of acrylic so you can see what is going on inside. The layout was more or less the same as V2 however the viscosity measuring probe was changed to plastic in order to reduce heat losses. We made a new water bath and melting pot assembly out of a plastic bowl and an empty tin can. The tin can was simply glued to the bottom of the plastic bowl with silicone aquarium adhesive. Circuit diagram of the water circulation system. The general procedure for gathering data went something along the lines of heat the chocolate to whatever temperature was desired and then cool it again. 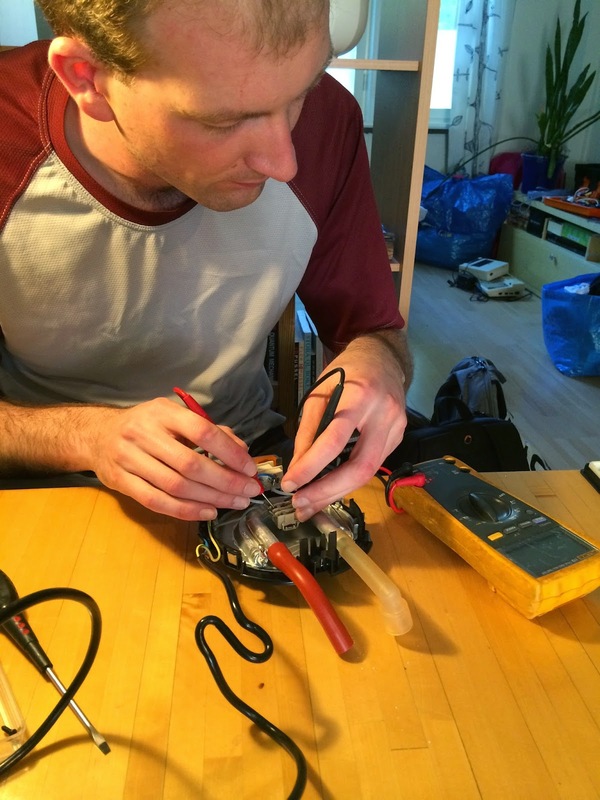 The cooling rate could be controlled by adding ice to a water bath around a length of the tubing. The cat decided that the ice water was very interesting. The data recorded by logger pro proved to be quite interesting. One can see the viscosity of the chocolate increase as it transitions through a liquid to solid change. Red = Water bath temperature. Blue = Shear force in the chocolate when rotating. Green= Angular velocity of the chocolate container. There are some pretty interesting kinks in the chocolate temperature graph as it solidifies... These only seem to appear when the chocolate is being stirred. When time permits I would like to spend some more time investigating this phenomenon.